Learn how to create painted peacock feather rocks. 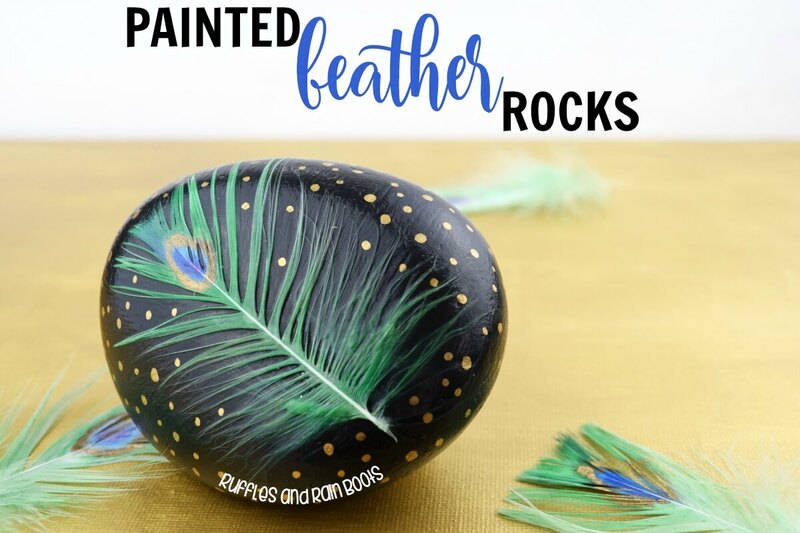 This rock painting idea uses your paint pens to create the most amazing painted feathers to secure onto painted rocks. We are having SO MUCH FUN painting rocks in our house. 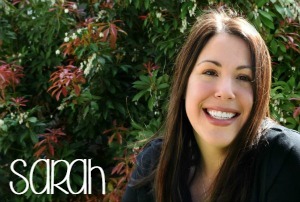 Both the adults and the kids are addicted to this fun, frugal craft activity. 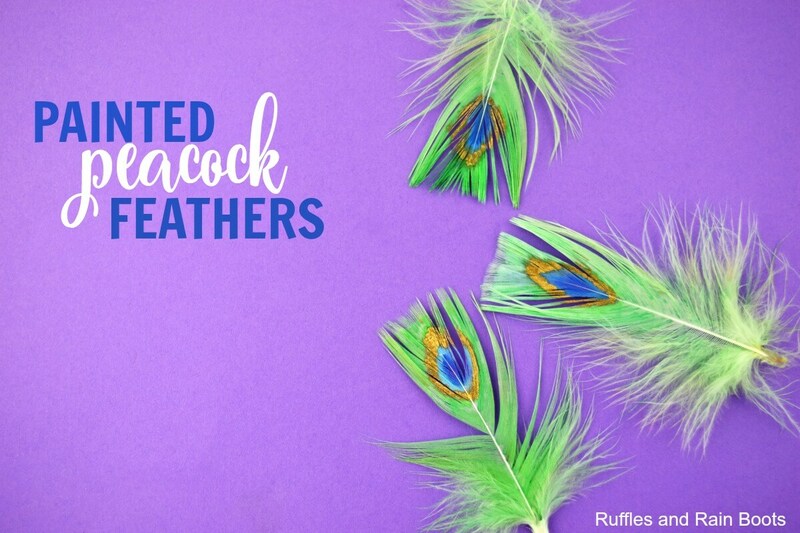 This week, we are using our painted peacock feathers to make gorgeous peacock feather rocks. Yes – we are attaching feathers to rocks! If you prefer video instruction for our painted peacock feather rocks, watch our short video below. Learn how to create painted peacock feather rocks. 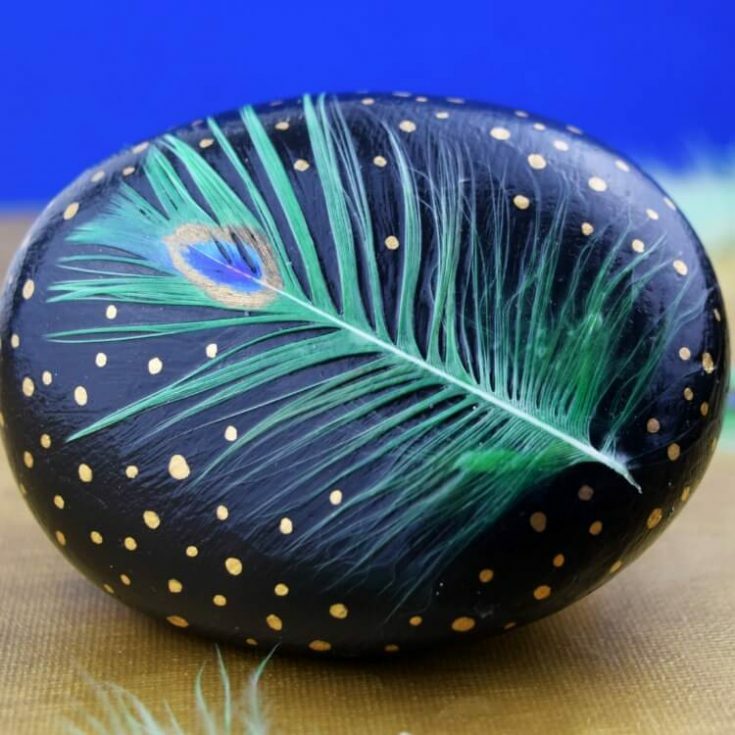 Once your peacock feather is brushed out and the rock has been primed (or cleaned), it's time to assemble our peacock feather rock. First, measure the feather to ensure it fits on the rock. Then, apply ModPodge in a light coat. Carefully place the peacock feather onto the ModPodge, smoothing out any areas where the feather doesn't lie flat. This is a bit tricky, but with practice becomes much easier. Just be sure that the center of the feather is flat against the rock - we don't want it to catch on anything and be pulled up. Once your feather has been positioned, coat it in ModPodge and let it dry. After the sealer has dried, decorate your rock with paint pens or acrylic paints. Seal the feather again with ModPodge. Before placing the rock in the garden or hidden outside for others to find, wipe on multiple coats of the polyurethane sealer. We’re having so much fun painting rocks here at Ruffles and Rain Boots. Below is a small gallery of what we’ve shared so far. Be sure to subscribe to our weekly newsletter to get all the rock painting inspiration! Please pin this to your favorite rock painting board on Pinterest.